I am Elisabet and my aim is to make you discover Buenos Aires not as a tourist but as a local. I started guiding 12 years ago. Before that I was an English teacher and one day a tour guide who needed to improve her fluency in English asked me for help. She showed me several books about Buenos Aires. I started reading them and I was fascinated by all the stories, facts and beauties Buenos Aires has. I was born here, but as a local you never pay enough attention to your own city; that always happens. So that´s when my life changed or better I decided to change my life. 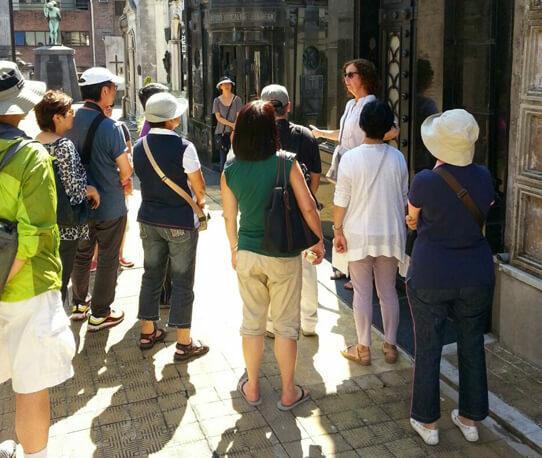 It was then when I discovered my passion: showing foreigners my beautiful Buenos Aires. I will take you to local restaurants, eat local food, learn about "mate" and I will tell you about our history, culture and customs. You will discover why Buenos Aires is called "the Paris of South America". I am also a Personal Shopper, so I can help you with your shopping. My team and I will be delighted to make you enjoy your stay in Buenos Aires. No matter who your guide is according to our availability, we will make sure the experience you have in Buenos Aires is one of the best you have ever had. I also have a team of very trustful drivers with whom I always work with. They provide their services with: car, van or minivan depending on the number of people. We also provide transfers to/from the airports. We are a team that makes the difference because we love what we do! !